Instabuilder 2 Review - The Best Landing Page Plugin for WordPress? 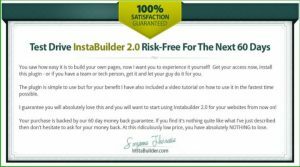 In this Instabuilder 2 review, you'll discover why I believe it's the internet marketer's dream come true. It's a versatile plugin for WordPress which is super simple to use. The interface is point, click, drag and drop and the final results are stunning. There are over 100 amazingly well-designed templates that are fully customizable. It's an ingenious way to create landing pages, squeeze pages, sales pages and more, right within your site in just a few minutes. It's fun and simple, too. This is why I love it and I'm convinced that any marketer will, too. What is the Internet Marketer's Dream Tool to Create Landing Pages? Sales funnels are notoriously tricky to create. Making them and integrating them with auto responders can be done with special themes, special page builder plugins or you can outsource the work to skilled web designers for a tidy sum. Optimizepress Theme for WordPress, for example, is a theme that can do landing pages to create funnels. It's not such a bad option to go for, but the problem here is that you're limited to using that one theme. Enter Instabuilder 2 WordPress Plugin. Being a plugin for creating sales funnels, it means you can install it on any theme you like. That's much more flexibility, less hassle and saves you heaps of time and effort. Marketers (bloggers) love it because of these reasons. Introduction to Instabuilder 2 – What is it? Instabuilder 2.0 is a landing page creator that uses a drag and drop interface. It comes with fully customizable editing options that are so simple that a kid could build a stunning page in about 5 minutes. When I first witnessed this plugin in action I was blown away by how quick and easy it is to make amazing squeeze pages, landing pages, thank-you pages and more. 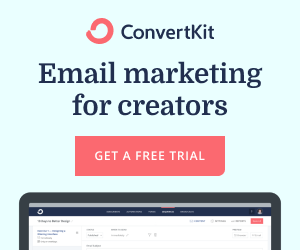 There are over 100 stunning Instabuilder templates designed to capture your audience's attention, which is exactly what you need to do to help you build your subscriber email list. There are systems in place online where you can pay $37 a month for a sales funnel setup and hosted. Great stuff, but imagine after 3 months you could have created your own and paid for it once. Why pay monthly for something that can be paid for just one time? I'd rather pay once than to pay $37 every single month, forever. Who is Instabuilder 2 For? You can create pages that have videos embedded. I use Youtube videos from my channel. You can use any videos either from your own Channel on YouTube or from another Youtube channel. You can use videos stored on your website. It's easy. This is a great way to introduce yourself and a product you're recommending to your visitors. It's also a good way to entice subscribers into signing up for your email list. 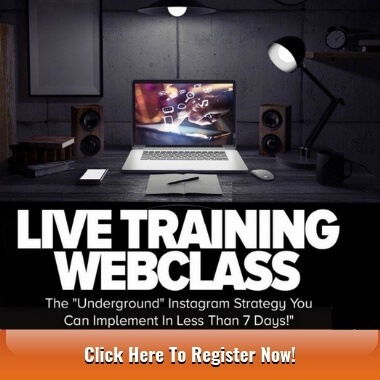 Once you've installed the plugin you'll notice an option that links you to training videos for Instabuilder. These videos are easy to follow, and in fact, you might not even need to watch any of them. 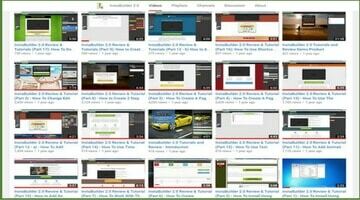 There is also a YouTube channel called Instabuilder. You'll probably not even need to watch those, either. Why? It's so easy to use! I found the only one I needed to watch was the one that shows how to add your autoresponder opt-in HTML code to an opt-in box. It was easier than I'd ever expected. What is Instabuilder 2 Support Like? Since I've never needed to contact support myself, I've fished around the internet looking for those that have contacted support for problems and all is clear. Support for Instabuilder is above par from what I've read. They obviously wish to keep every single customer happy. A happy customer is a potential customer for other products that are made by the same people in the future. How Much is Instabuilder 2.0? As you can see in the chart, there are 3 pricing points for Instabuilder 2.0. 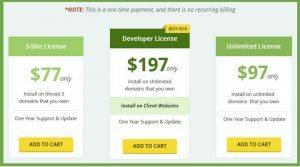 The cheapest one, $77, is for you to use on 3 websites that you own. Great if you only intend to have a single website. The next step up the pricing ladder is $97. This allows you to install the plugin on unlimited sites that you own. And the most expensive option is the $197 one. If you're a developer with clients then this one is ideal for you. You can install the plugin on all sites you create, meaning your sites and any site that you help to create for customers. What are the Pros and Cons of Instabuilder? I couldn't find any other than one, which took me a while to figure out because I'd never done it myself before. Installing the plugin is not as easy as one would hope. The plugin is big, you may need to use FTP to install it. Many Hosting companies don't allow over 8mb zip files to be uploaded using the traditional method. This is the dream tool for creating your own sales funnels with landing pages, squeeze pages, opt-in pages, webinar pages, video landing pages, thank-you pages, and more. The benefits of adding videos, opt-in boxes, images, logos and being able to customize everything on the fly make this plugin a must-have. Once you've given it a test-run you won't want anything else. 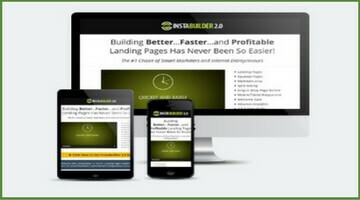 I Believe that Instabuilder 2.0 is the Best Landing Page Plugin for WordPress! Have you tried Instabuilder 2.0? Do you also think it's the best landing page plugin for WordPress or would you recommend anything else that you've used? Earlier in the week, I wrote more about this amazing landing page plugin. You can check it out here. I hope you enjoyed reading my review of Instabuilder 2. If you have any questions go ahead and ask me in the bottom within the comments section. I'll be happy to reply. My name's James, read more about me and this website here. This is useful, really a superb plugin and yeah the drag and drop feature is really useful to make the task easy and tasks. Landing pages play a great role in conversions. Look for another Instabuilder review to help you understand the tool. They have to come up strong to convince the visitors to join in. this plugin is suitable for those who don’t have tech skills and want to avoid coding headaches. Thanks for the great and in-depth review on Instabuilder. I got new insights from your review on the product and very helpful. Reading reviews will help us to know about the products and will save our time. Thanks for helping many people via your review. Keep up the great work I will come back to your website to learn more information. Wishing you all success! Hey Paul thanks for dropping in today. Instabuilder seems good as you mentioned. But it is quite complicated for a beginner, like me, to generate a manual landing page. That’s why instabuilder was created, Arooj. It helps people such as you and I to create these pages with ease and compete with the big boys. Hi Jim, I want to get into email marketing, it’s a new world to me, so I will need landing pages to collect email addresses right? Instabuilder 2 looks like a great landing page plugin, is this something I should use or add to Aweber? Please clarify to me the process as I am new to email marketing. Instabuilder 2 is a plugin for WordPress that adds the functionality to create landing pages. These pages are made up of templates, or you can make them from scratch, starting with blank canvas and uploading your own background image for example. You can add videos, logos, you can animate any element of the landing page such as making your logo swing in from the left, bounce up and down or do a little jiggle. When you’ve finished creating the page, you go to your Aweber and get an code and paste that into your landing page options where the optin code is created. Voila, your landing page is integrated with your stunning page. Instabuilder 2 rocks. If they make a third version, and I’m sure they will, I am definitely going to be taking a good look at it. You will love it, Anis! Super easy and literally, 5 minutes to create a great page. Great pages increase optins, don’t you know? Thanks Anis for your question. Hi James. I was always wondering how to create these landing pages and now I clearly see that many people use instabuilder for that. It looks really cool. I will try it for sure especially for email marketing. And I really do like the fact that it’s one time payment. I don’t like monthly subscriptions. Thanks Vasily for popping in with your opinion. What you liked about instabuilder 2 is exactly why I like it, too. As for other monthly payment options with other page builders, no thanks! You are super talented for what you are doing! When I grow up, I’ll be you! haha, you don’t want to be like me right now. I have a nasty case of sciatica and boy o boy it hurts. Slowly getting better though. Instabuilder 2 rocks, I have it on this site. 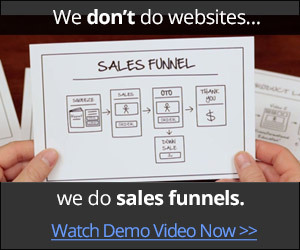 Interesting product, because I’ve experienced a similar product before, which is ClickFunnels. It’s also simple to use although it costs $97 a month. The interface is also simple and has a tutorial that comes along, then they have good support as well. I backed out from it though because I don’t want to commit to them. 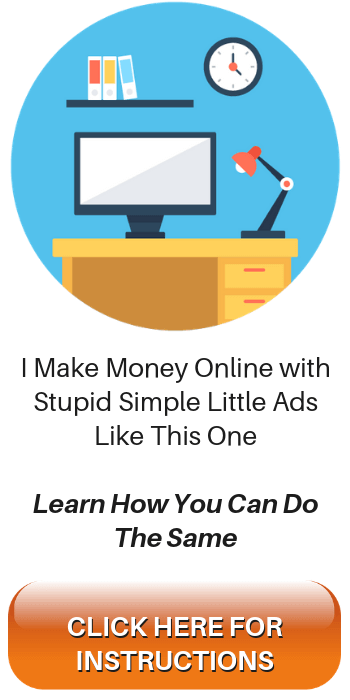 If you bundle ClickFunnels with Actionetics (Email) and Backpack (Affiliate), the price becomes $297 a month, which I really can’t afford right at the moment. The fact that InstaBuilder 2.0 is one-time makes it so enticing to try out. Thanks for sharing this product. Most welcome, Dom. It makes economical sense to pay once and keep forever. Solid review on Instabuilder2. This does everything you need it to do. I like the fact you can pick from many themes for your landing page. It seems to be very versatile and user friendly. That’s perfect for me. I want a program that I can have up and running and make great pages with. Sounds like you have used this program and love it. The pros out weight the cons. Thanks for laying out both. Thanks for taking the time to do the review. Great info! I do like it a lot, Tim. Awesome review man . Tell me did you use instabuilder 2 on this page ? No, I didn’t use instabuilder 2 for this page, but I could have. You can build any page with it. So far, I’ve only used it for specific landing pages, but as time goes on I can imagine using it to create every page on my site. Thanks for dropping in, Tim.